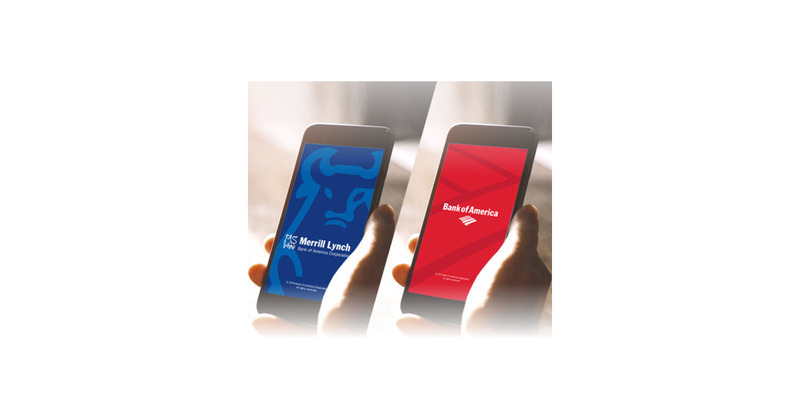 CHARLOTTE, N.C.–(BUSINESS WIRE)–Bank of America today announced that it is introducing a new feature that will allow clients to move seamlessly between the Bank of America, Merrill Lynch, Merrill Edge and U.S. Trust mobile apps without having to re-authenticate. The new feature is part of a broader approach designed to make it easier for clients to manage their banking and investing activities in one place. This enhancement is one of a series of updates to the award-winning mobile banking app from Bank of America and investing apps offered by Merrill Lynch and Merrill Edge, which deliver innovative solutions to clients based on their feedback. These enhancements provide clients new, interactive ways to use mobile apps, helping them to bank and invest on the go. The new app-linking feature will be available at Bank of America, Merrill Lynch, and Merrill Edge today and at U.S. Trust in November. Personalized cash flow: Bank of America clients, as well as Merrill Lynch or Merrill Edge clients with Bank of America relationships, can now view a personalized cash flow analysis along with income and spending insights across their banking and brokerage accounts. New biometric authentication features: Using the latest in biometric security technology, Bank of America’s mobile clients are now able to identify and authenticate themselves through other channels, including interactive voice response and call center platforms, with their mobile device. Biometric capabilities that clients use on a daily basis, such as fingerprint and Face ID, replace traditional forms of authentication. Shopping cart experience: Clients can now easily and conveniently shop for all of the services Bank of America has to offer from the mobile banking app. They can also save their progress and return to it at a later point by saving products to their shopping cart. Zelle® enhancements: As clients increasingly shift to cashless solutions, Bank of America is making it easier to manage Zelle person-to-person (P2P) transactions within its mobile banking app. The newly introduced Zelle Activity Center gives clients a consolidated view of all their Zelle activity. Enhancements to the app help clients confirm the identity of the friends or family to whom they are sending funds for the first time. Bank of America recently announced total Zelle sent and received transactions for the year surpassed $25 billion across more than 4 million active Bank of America users. Digital Mortgage Experience™ update: Bank of America is empowering its clients with a customized homebuying experience by allowing them to connect with their preferred professional lending specialist within the Digital Mortgage Experience. More ways to manage alerts: Bank of America is providing its clients greater control over how they choose to stay on top of their finances with proactive alerts. Clients can manage all email, text and mobile account activity notifications from their mobile banking app; this capability was previously only available in online banking. Statements and documents redesign: The statements and documents page has been updated to provide clients faster access to their recent statements across all accounts. My Rewards: Bank of America also recently announced its My Rewards dashboard – a single, convenient place available within online and mobile banking that allows clients to manage their Bank of America rewards across the bank’s rewards programs, including Preferred Rewards, credit cards and BankAmeriDeals. Also coming soon to Bank of America’s mobile app is an improved mobile Bill Pay experience, which will begin rolling out to clients later this month. One of the industry’s first, Bank of America’s mobile Bill Pay will offer additional features that were previously available via online banking, including the ability to add and maintain automatic payments, search history, and pay multiple bills at once – all from clients’ mobile banking app. To learn more about these new updates, visit bankofamerica.com. Merrill Lynch is a leading provider of comprehensive wealth management and investment services for individuals and businesses globally. With 14,820 financial advisors and $2.3 trillion in client balances as of June 30, 2018, it is among the largest businesses of its kind in the world. Bank of America Corporation, through its subsidiaries, specializes in goals-based wealth management, including planning for retirement, education, legacy, and other life goals through investment, cash and credit management. Within Merrill Lynch, the Private Banking and Investment Group focuses on the unique and personalized needs of wealthy individuals, families and their businesses. These clients are served by approximately 200 highly specialized private wealth advisor teams, along with experts in areas such as investment management, concentrated stock management and intergenerational wealth transfer strategies. Merrill Lynch is part of Bank of America Corporation. Merrill Edge is a streamlined financial platform that offers access to online and advised investing, trading, brokerage and Bank of America banking services. Clients can be self-directed; work with a Financial Solutions Advisor™ to use managed portfolios; or access Merrill Edge Guided Investing, an online advisory program that offers Chief Investment Office-directed portfolio management strategies. Merrill Edge surpassed $200 billion in investment assets under management and more than 2.5 million accounts as of Sept. 11, 2018. Merrill Edge’s growth represents a 54 percent increase over the past three years. Bank of America is one of the world’s leading financial institutions, serving individual consumers, small and middle-market businesses and large corporations with a full range of banking, investing, asset management and other financial and risk management products and services. The company provides unmatched convenience in the United States, serving approximately 67 million client relationships with approximately 4,400 retail financial centers including more than 1,700 lending centers, more than 1,900 Merrill Edge investment centers and more than 1,300 business centers, approximately 16,100 ATMs, and award-winning digital banking with more than 36 million active users, including 25 million mobile users. Bank of America is a global leader in wealth management, corporate and investment banking and trading across a broad range of asset classes, serving corporations, governments, institutions and individuals around the world. Bank of America offers industry-leading support to approximately 3 million small business owners through a suite of innovative, easy-to-use online products and services. The company serves clients through operations across the United States, its territories and more than 35 countries. Bank of America Corporation stock (NYSE: BAC) is listed on the New York Stock Exchange. MLPF&S is a registered broker-dealer, registered investment advisor, Member SIPC and wholly owned subsidiary of Bank of America Corporation.